Diminishing rule of law in Turkey and EU’s blind allegiance to economic benefits. 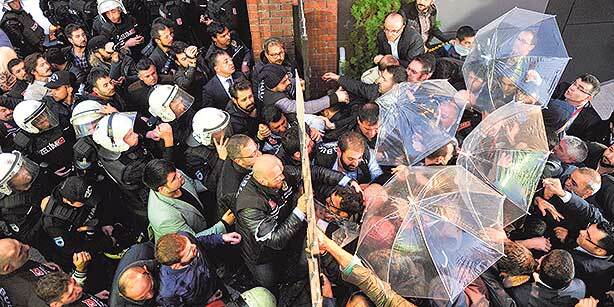 Today Turkish police attacked the headquarters of Koza Ipek in Istanbul, Turkey. A September ruling from an obscure, recently established and much maligned “Peace Court” ruled that the media conglomerate was too aligned with the Fetullah Guhlen movement. During the attack the news broadcasters for both Kanalturk and BugunTV continued to broadcast live, providing viewers with real-time coverage of the assault. When it became clear that the police would prevail, the two stations were taken off the air. However, the left-leaning HalkTV continued with its live broadcast. It has been reported that a simulcast was attempted via a staunchly pro-government news station hours after the assault. Turkey has seen a wave of assaults against opposition media, while the pro-government “pool media” have turned their eyes elsewhere. Opposition media headquarters have been attacked and journalists assaulted, prompting several European ambassadors as well as the U.S. ambassadors to visit opposition media headquarters in a show of solidarity. In the meantime the pro-government media ignores the situation, choosing instead to broadcast the official reports of grain and corn harvests. All the while, Turkey’s economic downward spiral–or is it now a plunge? –continues, with the central bank warning of inflation hikes and the tourist industry recording an almost 20 percent loss of revenue due to ongoing problems with Syria, immigration, and internal political violence. The 1 November election will NOT result in a single party government for any of the four main political parties. Although the nationalist MHP party has signaled that it is willing to form a coalition with either the AK or the CH parties should either gain the majority of votes, it is by no means certain that the MHP will surpass the 10 percent parliamentary threshold need to form a coalition. It is the opinion of NEC-SE that the MHP will not surpass that threshold and that this failure will be seen as a major rebuke against their ailing long-time leader, Devlet Bahçeli. This will trigger a major reformation of the party and his replacement as leader. The MHP’s loss, and CHP’s gain, will not, however, allow the CHP to topple the AKP. A coalition government will still be necessary and, absent the MHP’s support, the AKP will not be able to form a coalition government, causing Turkish President Recept Tayyip Erdogan (RTE) to push for another election, possibly on 1 March. During the run up to this election, expect a violent backlash against the Kurdish population. Prime Minister Ahmet Davuto?lu has already alluded to a reemergence of the “White Ford Taurus” campaign of the 1990’s, when hundreds of Kurdish leaders were kidnapped and disappeared, reportedly by the occupants of white Ford Taurus automobiles, if his AK party did not win an outright parliamentary majority. This is the first mention by a government official that the campaign was officially carried out by the government, and carries huge international significance. In short, what we are seeing is a political party using the security apparatus of the state, in its entirety, to threaten the voting public into supporting their party. If the MHP gets 10 percent it might squeeze through. The Kurdish party will grow to probably about 15 percent, the CHP will top out at 28 percent, the AKP at 39 percent, the HDP at about 15 percent, and the MHP at about 11%. The combined total is 93 percent, which means a wiggle for all three would topple the MHP. The MHP’s loss will be the CHP’s gain, because the CHP’s leader has been seen as a moderating voice these past few weeks, alternating between pro-security and pro-common sense. Thus the CHP can be seen as the real victor in this election, and will certainly cause Turkish President RTE some consternation. In conclusion, the NEC-SE sees the CHP gaining up to 30 percent (they received 26 percent in the last election), with the change coming from non-voters in the last election and vote switchers from the MHP. The CHP will still lose out to the AKP, but the AKP will hold on only to their core voters of probably 38 percent and nothing else. I look to the AKP to lose votes from 7 June, but this will be their rock bottom. There are too many rural, under-educated, “farm hand” voters in Turkey for the AKP to lose outright. If the AK party wins, its victory will be due its business ties with the EU and other “parties” inside and outside of the region. The EU prefers that the current business relationship with the AKP members not be severed. It should be noted in this regard that the AKP has contracted with the EU to take care of Syrian refugees in Turkey in exchange for substantial monetary payouts. That being the case, one must ask what EU is getting from Turkey in return. By way of providing an answer, we would ask our readers to recall that when U.S. Delta Team operatives killed Abu Sayyaf we discovered that he was selling oil on the cheap to Turkey. When oil prices fall to $20 USD per barrel, do not be surprised if we further “discover” that ISIS was selling oil to the AK party for as little as $1 USD a barrel. With these cheap oil prices plus the deal with the EU to keep refugees in Turkey before the 1 NOV 15 elections at a cost of 3.4 Billion Euros, why would the Europeans not be happy to have such a dealmaker in their corner and in charge of Turkey? NEC-SE understands that international deals and multimillion-dollar business supersedes national interests, as well as the goal of attaining peace in the Middle East. Will common sense prevail regarding arms purchases for Mexican Authorities or must we all succumb to drug cartels, Islamic State and NGO´s?